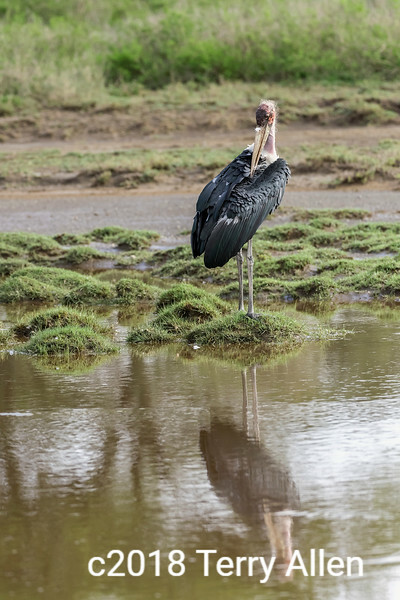 Maribou stork (Leptoptilos crumenifer) preening, with reflection, Lake Ndutu, Tanzania. Preening helps to oil and align the feathers and keep them waterproof. This bird has one of the downy underwing feathers on its bill and another sits on the water. Interestingly these downy feathers have been used for fashion trims. Indeed grooming is important for all species. Great shot Terry! I'm glad that the Maribou Boa is not really a current fashion statement, as I doubt they "harvested" the underfeathers from live birds. You can still buy feathers called Maribou feathers in craft stores and on eBay. Interesting to speculate how each bird learns, is is hard-wired for, the survival skills it needs, when most birds don't spend a lot of time hanging around their parents, once they've fledged. Interesting information regarding this bird!